New Release! 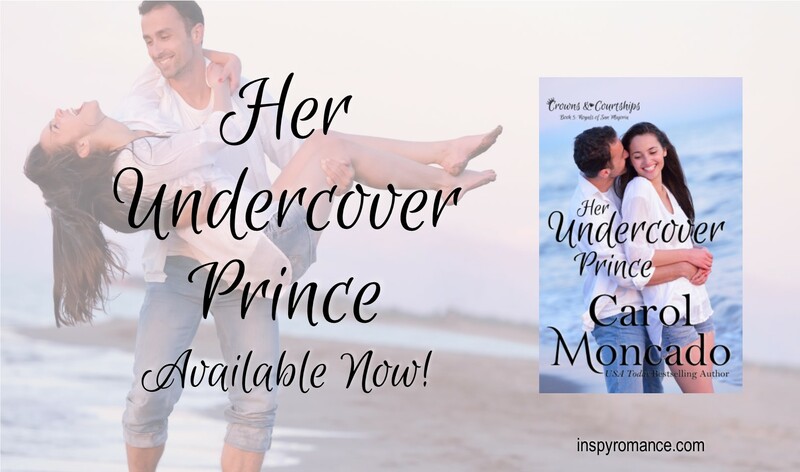 Her Undercover Prince Excerpt! I hope y’all are doing well! Have you ever wondered what authors do on release day?! For me, it involved a bunch of stores, shopping for food to feed 155 band kids the next day, then loading most of it in the truck for our competition. But it kept me from obsessing over reviews and pages read through Kindle Unlimited and everything else ;). I’m already hard at work on the next one, but thought I’d share a snippet of Her Undercover Prince with you today! With a sigh borne of more than one kind of frustration, Princess Jacqueline Grace Victoria Eliana of San Majoria stifled the urge to reprimand her foster daughter as strongly as she wanted to, not with cameras following their every move. She’d probably be excoriated in the press for letting Kiara run off like she did. In reality, any other child likely would have done the same within sight of the bouncy castle situated on the beach. But Kiara wasn’t other children. She was a ward of the state, being cared for indefinitely by the royal family, specifically Jacqueline Grace, and could likely never be adopted. If her family was ever found, Jacqueline Grace would have a hard time handing her back over without a serious investigation into why they’d gone so long without their daughter. She’d also be held to account if she didn’t put sunscreen on Kiara. But if she did, there would be some who called her out for using the wrong brand. Jacqueline Grace hurried after Kiara, her security team members flanking her as they walked across the soft sand. Maybe there was a benefit to having a dedicated nanny. No. She needed more than that. She needed a partner. Someone to come alongside her and share her burdens. Kiara had tossed her sandals to the side and had already found a new friend while jumping in the bounce house. The security team directed Jacqueline Grace to a cabana set aside for her to use. She dropped her large shoulder bag on one of the chairs. Tim, her security guard, looked outward even as he asked the question. “No, thank you. I have some water and snacks.” She pushed her sunglasses onto the top of her head. She’d no sooner settled into her chair than Kiara ran up, a little girl in tow. The girl’s tear-stained cheeks brought out Jacqueline Grace’s compassionate side. Before they took two steps, a man ran toward them. Tim stepped between Jacqueline Grace, the girls, and the frantic man. “You need to back up a few steps, sir.” He didn’t touch the man but moved him back. Relief swept through Jacqueline Grace. That was over quickly enough. She returned to her seat. “Thank you,” the man called around the security guard. Both girls turned on the man. “Please?” The hints of whine in Kiara’s voice would surely be reported on by the members of the press close enough to hear. We? He was planning to stay with her? Her Undercover Prince is book 5 in the Crowns & Courtships series! You can pick up an ecopy or read through Kindle Unlimited now – paperbacks will be available shortly :). Hi Carol! Wow! Feeding 155 band kids, what a labor of love. Always enjoy reading your well crafted thought provoking Crown and Courtship stories. Your characters’ struggles seem so real. While I may wish to be royalty for a day, not sure I am cut out for the drama that goes with the title of being a modern day princess or queen. Best wishes and happy writing. I’m kind of the same way! The cash would be nice. The rest? Eh, not so much ;). I read it almost as soon as it came out and enjoyed it as always. Teenagers are fun and a lot of work. It gets quiet when they leave for college or jobs or marriage! But then……grandchildren are lots of fun! God bless! Hi Carol! I always enjoy your Crown and Courtship stories and this one was no different! Hi Carol, I’m a fan of this series and will be reading this book as soon as I can. Will you spell Kiara phonetically for me, so I know how to read it. I hate stumbling over names in my head. :) Thanks! Sounds like a very busy day. :) I love all your books and Her Undercover Prince is no exception. Was wondering through much of the book what Dave’s story was, and what everyone was so nervous about. Days are always busy but that’s okay – I love my kids! I have a plan for Dave’s family – but not sure when that’s gonna come about. Hi Carol, I enjoyed this- the bit of suspense that remains unsolved leaves me eager for the next book!! Hope band goes well- that is a lot of food to organise. It is a lot – but I love my band kids so it’s all good ;). As far as I know he was eaten by sharks. I was wondering the same, but figured he was really gone this time.